Gwen is still a very head strong character. Although she spends a good time wallowing in her sorrows, she’s a girl who’s able to get things done! I love how dedicated she is to finding her own destiny, her ability to defy the Guardian’s expectations, and how she is able to take even the most shocking news with confidence and rationality. Even if she is a bit of a drama queen! A lot of new information is revealed in Emerald Green that made me question a lot of what I’d already read. There were so many characters that I’d forgotten about, and intricacies in the time line that I couldn’t remember that I think it would’ve been beneficial to marathon this trilogy! Of course, I could still remember the secondary characters like Lesley and Xemerius, and I was glad to read that they had prominent roles in the finale, as they were my favourite characters. I also really enjoy Gwen’s grandfather, because he’s just so helpful! The secondary or minor characters are used to add detail to the plotline, but they still have character arcs that mean their individual backstories are significant. I think there could’ve been a lot more dvelopment and exploration into the other time travellors that aren’t mentioned much, and ever the other members of the organisation could have had more detailed backstories. Overall, Emerald Green ties the loose ends of the prequels even though the ending is still quite open. I’ve always had a problem with Gideon and Gwen’s relationship. I felt like it came out of nowehere. Now, it’s been a while since I’ve read Sapphire Blue, so I didn’t quite understand why Gwen was angry with her love interest, but luckily for me her devastation is the main plot point of the first half of the novel, so I caught up quickly(!) Suffice to say their relationship continued to be up and down thoughout the novel and, as a reader, I was a lot happier when Gwen was. I enjoyed the development in their relationship, even if it was very ‘insta-love-y’ and the changing nature of their relationship was frustrating albeit adorable. I wanted there to have been more development between Gwen and Charlotte. There was a lot of anymosity between the two thoughout the whole series, and I think it would have been a lot better if the two made their piece. This adds to the whole ‘open’ ending situation, it’s up to personal interpretation as to how Gwen’s family continue to function after the threats are dismissed. 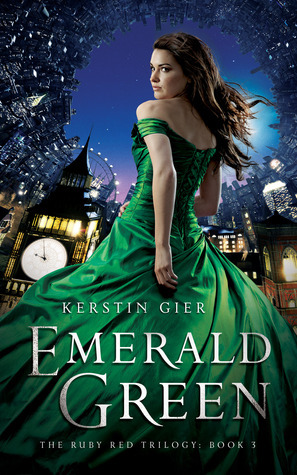 I’ve already mentioned the slow pace, but there was also a lot more time travel in Emerald Green than the other novels, which helped to drive the plot forward. It was a relatively easy read, and a good end to the series. Overall, I’d say that it was quite anticlimactic, but it’s defintely a series that I would recommend marathoning. Therefore I gave Emerald Green 2.5 stars, because it was a well written conclusion, but I wouldn’t exactly call it a page-turner.